It’s not often here at Sidequesting that we get asked to check out a product associated with an ongoing Kickstarter campaign. Even less often is that campaign for a tabletop game. But when our friends over at Black Table Games asked us to check out their retro arcade inspired game Inglorious Space, we jumped at the opportunity. 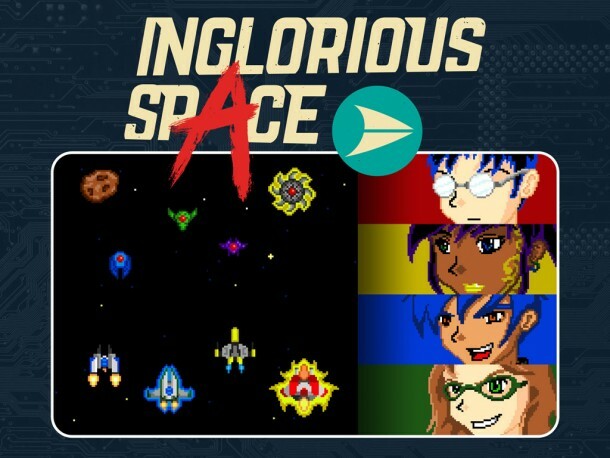 Inglorious Space takes the quick twitchy action of arcade shoot-em-ups like Galaga and turns it into a methodical turn based affair that can be tackled alone or with friends. Players destroy enemies to acquire upgrades and score points while screwing over their friends, in an effort to be the best bounty hunter in the galaxy. 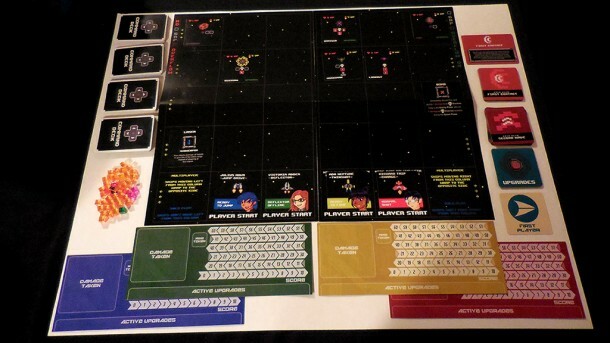 Everything from the player characters to the playmat itself should be instantly recognizable to anyone who has played those classic games, but with its own subtitles that help it stand out from them. The game is played through a number of different phases, giving both players and enemies a chance to move and attack. It’s in between the resolving of these phases that players need to survey the field and plan out what they need to do to score points, while also considering what their friends (soon to be bitter rivals) might also do. The Player Phase is where players will take actions like moving or attacking enemies. Players can also ram another player’s ship out of the way preventing them from finishing an enemy off and scoring points, but also causing damage to both players. Since each player has the potential of taking up to five actions during this phase, one’s ability to strategize and adapt their plans to what everyone else is doing will be crucial to achieving victory. During the Enemy Phase, enemies move down the map while attacking. This might put them in range to attack a player, or they might move off of the bottom of the play field. In the arcade games that inspired Inglorious Space this might cause a ship to reappear at the top or disappear completely. Here each player takes damage every time a ship leaves the bottom, giving the players a reason to work together, while also creating options for them to make choices against each other. Once the enemies move a Spawn Phase takes place where more enemies enter the play field and attack. Inglorious Space and its subtleties really shine through with multiple play sessions. The group I played with spent a few games working together feeling out the game, then spent a few games looking out for themselves and destroying friendships. It’s the balance of needing to work together while also wanting to make sure you come out on top that Inglorious Space truly gets right. As of this writing Black Table Games’ Kickstarter for Inglorious Space still has just over a week to go and is about $200 shy of their funding goal. You can find that link HERE.